Productivity means getting lots of things done quickly and efficiently, right? Quick means easy… right?? I don’t know, maybe all that matters for global shipping departments and digital media. But, as an artist, mindfulness aficionado, and hall monitor for creative time management, I kind of crave the olden days. By “olden days,” I don’t mean pioneer life! Although, don’t most 40-somethings long for a quiet summer afternoon of pretending to be Laura Ingalls Wilder? Life on Little House seems so uncomplicated compared to today, doesn’t it? But I digress. When I say “olden days,” I mean the slower pace of my own childhood. When there was the delicious expectation of a letter in the mail from a penpal. And everyone waited with the same anticipation to find out who shot JR! You had time to get up for a snack during commercials and “Back to School” wasn’t a retail theme until the last week of August. Efficiency and productivity was only a major concern for factories and big business. Not for the average citizen. I know, I know. I’m pining for times that were often quite inconvenient. But there is something to be said for appreciating the things we are forced to wait for. With all that in mind and my concerted effort to more completely “switch off” at night, I’ve been doing a lot of hand stitching and “slow crafting” in the evening. If we’re connected on Instagram, you may have seen some of my projects. I’ve always enjoyed doing handwork, and even find that it’s far more accurate for some projects like complex piecing. The pentagons in my “Sacred Geometry” quilt were hand-pieced. Those Y seams would have been a hassle on the machine! Lately, I’ve been engineering projects specifically for my “slow crafting” sessions. Tiny English paper piecing projects (3/4″ hexies!? yowza! ), hand applique, and manual embroidery have all made appearances. I like to think of these projects as a bonus meditation period in my day. Slow crafting projects are portable so I can take them with me anywhere. They help me slow down and wind down no matter where I am. English paper piecing (EPP) and applique are the darlings of handwork! In the sewing and quilting industry, there is a lot of emphasis on gadgets, fancy machines, and expensive supplies. This is all well and good (trust me, I have my fair share of all the “stuff!”) but handwork is SO economical! With a needle, a spool of thread, and a few bits of fabric, anyone can make something! It only takes a few skills and some imagination. 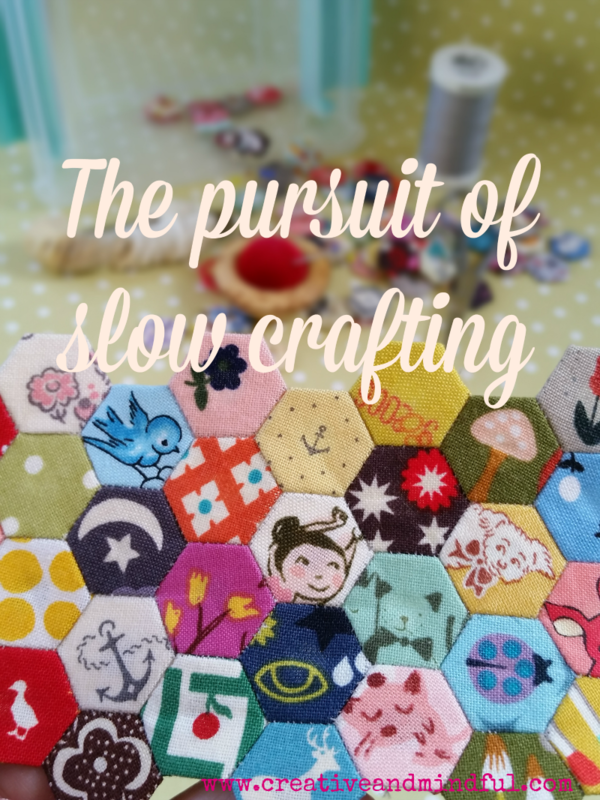 Are you into slow crafting? If so, what do you make? Please share in the comments!